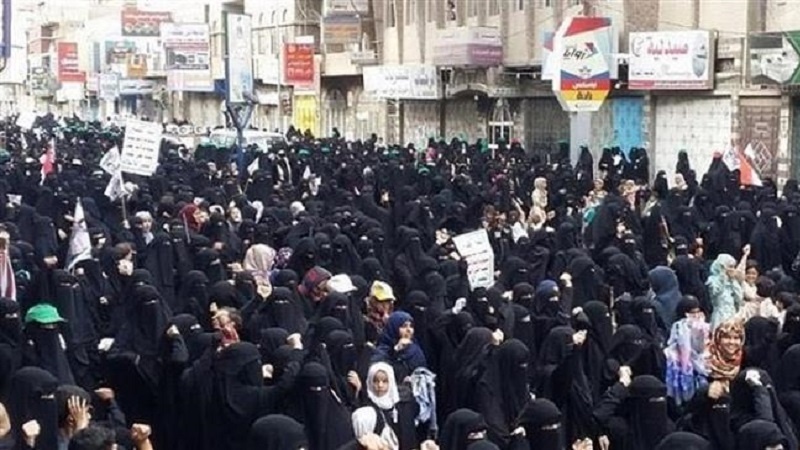 Hundreds of Yemeni women have taken into the streets of the capital, Sana’a, to denounce deadly Saudi-led aerial assaults, the latest of which hit the port city of Hudaydah. According to Press TV, the demonstrators marched in Sana’a’s main roads on Saturday while carrying placards and Yemeni national flags. Saudi Arabia and its allies launched a brutal war, code-named Operation Decisive Storm, against Yemen in March 2015 in an attempt to reinstall former Yemeni President Abd Rabbuh Mansur Hadi, a staunch ally of Riyadh, and crush the popular Ansarullah Movement. The imposed war, however, has so far failed to achieve its goals, thanks to stiff resistance from Yemeni troops and allied Ansarullah fighters. Several Western countries have been supplying Saudi Arabia with advanced weapons and military equipment. Yemen is now suffering from the worst humanitarian crisis in the world due to the Saudi aggression and siege. In its latest war crime in Yemen, Saudi warplanes struck a hospital and a fishing harbor in Hudaydah on Thursday. A source at Hudaydah’s health office told the Middle East Eye news portal that the air raids had martyred 60 people and wounded more than 100 others. The source also noted that medics were struggling to respond to patients’ needs in Hudaydah. Backed by Saudi-led airstrikes, Emirati forces and pro-Hadi militants launched the Hudaydah offensive on June 13 despite international warnings that it would compound the impoverished nation’s humanitarian crisis. Saudi Arabia claims that the Ansarullah fighters are using Hudaydah for weapons delivery, an allegation rejected by the fighters. Separately on Saturday, Ansarullah’s Spokesman Mohammed Abdulsalam, told Iran’s Tasnim news agency that Yemeni fighters were conducting a military operation against the aggressors in the country’s western coast using tactics that would eventually force the invaders out of the region. So far, he said, Yemeni forces have managed to take a total of 60 mercenaries captive. Abdulsalam further stressed that the operation around Durayhimi would continue and that the neighborhood in Hudaydah as well as other towns on Yemen’s western coast would be turned into the aggressors’ graveyard.